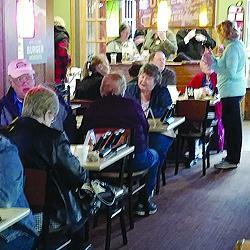 Flapjack Fundraiser Stacks Up a Winner! Past President Becky Huber, ready to greet yet more hungry customers. Thanks to all who made our first fundraiser of 2017 a big success! Saturday, March 11, 2017: from 8 to 10 am, Lakewood Historical Society took over the Lakewood Towne Center Applebee's and served up a hearty breakfast of pancakes, scrambled eggs, sausage and bacon to all the many supporters who had bought tickets to our first ever "Flapjack Fundraiser." Those who attended and are members of long standing may have thought the wait-staff looked a bit familiar. Not surprising, given all the LHS officers and board members who enthusiastically lent their helping hands to every little chore from taking tickets to pouring coffee to busing tables--among them current President Sue Scott, Vice-President Ed Voie, past President Becky Huber, Secretary Sharon Taylor, Treasurer Jim Curley, Museum Manager Emma Pierce, Marketing Liaison Cindy Duhamel, Board Members Kris Kaufmann and Glen Spieth. At the end of the day, no one went away hungry--and the LHS kitty had a nice, full feeling as well, the event having netted a sweet-as-maple-syrup $895.00 So take heart if you missed this year's spread--odds are pretty good there'll be more in the future.